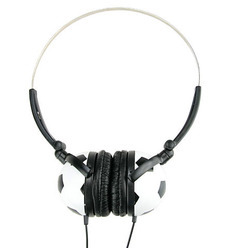 Mm, headphones that look like a split soccer ball – interesting. I’d like to see these in a range of different sports balls – tennis, basketball, golf. Out in time for the world cup, the Soccer Stereo Headphone comes with 180 degree rotatable earpieces, supports frequencies from 12000-23000Hz and has a maximium input of 100mW. Good for your little brother?